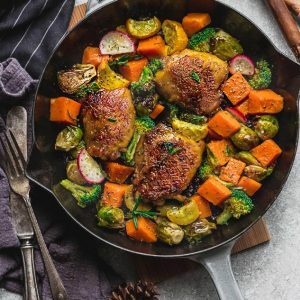 Instant Pot Harvest Chicken with Vegetables - the perfect easy low carb / keto-friendly complete meal for fall. Best of all, this pressure cooker chicken recipe cooks up tender, juicy and full of flavor with Brussels sprouts, pumpkin, broccoli and yellow zucchini. Includes instructions for the Instant Pot & stovetop.